Like oxygen enriched veins, foot paths lined with leafy trees criss cross through the city’s green heart, Bute Park. Just beyond the legendary Cardiff Castle, this park is one of the largest in Wales and is home to urban woodland, sports fields, an arboretum and a river corridor. Ideal for bonding with nature and a picnic or two, this park contrasts beautifully with the busy city. Built by gardener and horticulturist Andrew Pettigrew, the 130 acre parkland was built between 1873 and 1903 as a private oasis of pleasure for the Bute Family. It was created right in the center of Cardiff, and is surrounded by the gushing River Taft, Pontcanna Fields and Sophia Gardens. The Bute family gifted this jewel of a park to the city in 1947 and it’s now managed by the local government. The Park is huge and home to innumerable breeds of local trees and vegetation, with some of the strongest and largest specimens of plant-life throughout the U.K. Whether you want a fun picnic in the lush greenery, a sporty day out or some alone time with Mother Earth, this park will relax, rejuvenate and invigorate your senses. Hunters of the historical will love the sites and buildings that date back to Roman and medieval times, such as the Animal Wall, the enchanting Gorsedd Stones and the Blackfriars site. Dating as far back as the 12th century, you’ll definitely have a multitude of historical, architectural and natural facts and features waiting for you dig them up. Nature lovers will be able to appreciate the mix of unique, ornamental trees that were specially planted here in 1947. Huge, healthy and constantly growing, these trees are some of the finest examples of their kind in the country. It’s only natural that such beautiful trees and the nearby river will attract a host of life that thrives on them, and the park is also home to otters, tree creepers, woodpeckers, herons, leaping salmon, damselfly and all kinds of fungi. The Education Centre is unique in the sense it teaches you about the park’s incredibly rich past and diverse flora and fauna. Craft activities, artwork, trails and maps, free Wi-Fi and a whole host of other features elaborate upon the qualities of the park. There are tons of festivals, concerts and marathons held at the park on almost every day of the year. LGBT pride festivals, Family Walks and numerous other themed events happen, so no matter when you decide to visit, there will be an event taking place. With two resident cafes and a tearoom, expect delicious snacks and drinks to accompany you on your day out. Tips and Warnings: Pedestrians have priority over all other users in Bute Park, even in areas designated and marked for other purposes. Please be considerate of pedestrians when using our pathways, especially when passing. Using a bell and/or wearing high visibility clothing will help others be aware of your presence. Due to day-to-day operations such as litter collection, grounds maintenance and deliveries, you may encounter some vehicles while in the park. Also note that traffic volumes will increase during events and improvement works so take extra care at these times. Car parking is available at Sophia Gardens and North Road car parks (charges apply). Coach parking is available at Sophia Gardens. Easy access to and from the Taff Trail. Cycle hire facility at Pontcanna Fields. There are several bus stops situated along Castle Street to the south, and along North Road to the east. 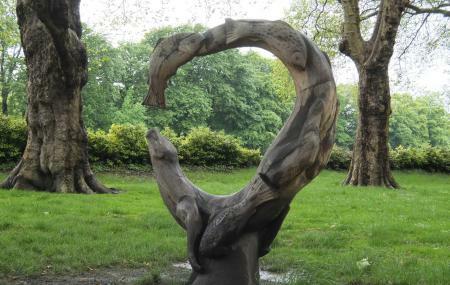 Bute Park is roughly 10 minutes walk from Cardiff Central station and 15 minutes walk from Cardiff Queen Street. The water bus stop is situated at the southern end of Bute Park near Castle Bridge. How popular is Bute Park? People normally club together The Cardiff Story and Millennium Stadium while planning their visit to Bute Park. People also prefer to end their day with Bute Park. Oh Bute park was a treat to the eyes. We were in Cardiff when the temperatures were soaring and what a better place to spend the afternoon than the Bute park. Right in the city centre next to the Cardiff Castle, the park was blossoming with spring colours and filled with People enjoying the bright sunshine. In spite of the crowd, the park was very clean and well- maintained. The spring colours added more beauty and it was a great experience walking around. The lungs of Cardiff. Tranquil setting. It hosts many varied events. People of Cardiff are fortunate to have it in the centre. You can catch a boat from here to the Cardiff Bay, enjoy some refreshments at the park cafe, or just enjoy a stroll taking in the sights and smells of the lovely park. Bute park is an absolute jewel in Cardiff's crown. There is nothing not to like, loads of interest for the horticulturalist with long herbaceous borders, a fantastic collection of trees and vast green open spaces. A few decent options to grab coffee, cake etc. Is part of the taff trail so can be explored by bike and is a lovely place for a run! The RHS Cardiff flower show was there this weekend. Well worth a visit. Lots of flower displays and plenty of stalls selling all things gardening. Also plenty of food stalls so there was no chance of going hungry. All in all a good day out. Loved it. Huge park, mainly grass, well forested and dog friendly, with excellent wheelchair access. What's not to love? It seemed very popular and used extensively by locals and visitors. One great point is that it is right in the middle of the town. It seems to be a fantastic location for people-watching and squirrel seeking! All in all, it is a rare gem of a park.